“So much for the safety and stability of bonds, right?” says an article at CNBC. “Vanguard Total Bond Market Index ETF (BND) is down near 5% this year,” the article continues. “Vanguard’s Long-Term Corporate Bond Index ETF (VCLT): a whopping 11.50% year-to-date decline. The long and short of it: Bonds, a very traditional safe-haven play when the stock market goes haywire — think Panic of 2008 — have proven to be neither safe nor a haven in 2018. Author of Rich Dad Poor Dad Robert Kiyosaki has this to say about conventional methods of diversification: “Most financial planners will tell you to invest in stocks, bonds, mutual funds, gold ETFs, REITs and mutual funds. “But that’s not diversified. It’s filled with only one class of assets: paper assets. That jibes with what we’ve been saying all year… something about the end of the boom stage in the boom-bust cycle? He explains: “There are actually four distinct sources of cash flow. Each is quite different from the other, and each defines and determines a very different lifestyle, regardless of the amount of cash you earn. 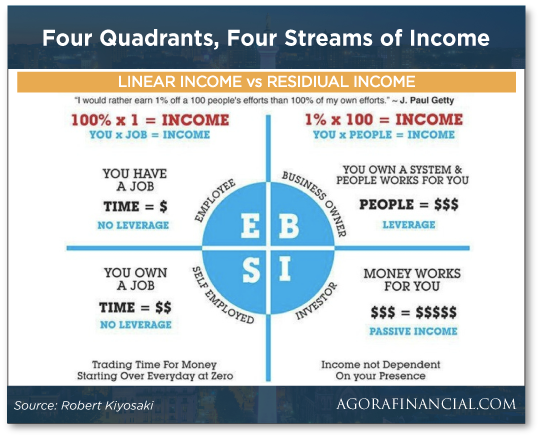 “The cash flow quadrants represent the different ways cash income is generated,” says Robert. Simply put, you have a job and “the amount of active work equals income,” Robert says. In this equation, time is literally money. “Our educational system and culture train us, from the cradle to the grave, in how to live in the world of the E quadrant,” he says. Here, instead of people working for you — as in the B quadrant — you put your money to work for you. As to the four quadrants, Robert explains: “I’m not saying being an employee is a bad thing… I’m just saying it’s only one way of generating income, and one that is extremely limited. “In times of uncertainty,” Robert says, “we look for other ways to generate income. When we know we can’t rely on employers, we begin to look to ourselves. In that case, Robert says it’s not just about changing jobs. “What you need to do is change quadrants. “Breaking away from those typical job structures and creating your own stream of income puts you in the best position to weather an economic storm,” says Robert, “simply because you are no longer dependent on a boss or on the economy to determine your annual income. Robert Kiyosaki’s Retirement Masterclass will show you 49 secrets the rich use to collect anywhere from $1,168, $2,551 to even $4,377 in predictable weekly cash flow — something most people don’t even know about! To the markets, where the Dow’s risen almost 300 points as tech shares start to perk up. Likewise, the S&P 500 is up 26 points, to 2,648.95; the Nasdaq sits at 7,024.45, up 85 points. On to commodities: Oil’s price dropped dramatically Friday; it’s up today by $1.46, to $51.88, for a barrel of West Texas crude… still remarkably low. Gold’s price is stable at $1,223.20 per ounce. Bitcoin continues its steep slide — down $443.95, to $3,563. The UAW, however, is having none of it. “This callous decision by GM to reduce or cease operations in American plants, while opening or increasing production in Mexico and China plants for sales to American consumers, is, in its implementation, profoundly damaging to our American workforce,” says Terry Dittes, a UAW vice president. The union says it’s exploring all legal options to block GM’s decision. “As a trader, I tend to focus on charts, not politics,” says our CBOE insider Alan Knuckman. “That being said, the post-midterm price action on health care is flashing green on my screen. Don’t worry, Alan’s not diving into the political swamp; instead, he’s following a stock sector’s price action. “As you know, Republicans tried several times — unsuccessfully — to repeal Obamacare. And many GOP candidates ran on the promise of repeal in the midterms. 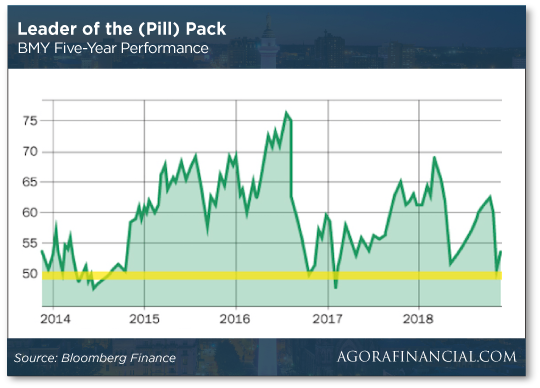 Alan says: “The big ‘blue’ wave couldn’t have come at a better time… that’s because health care companies are reporting stellar earnings this quarter. Alan’s watching “smart money” stealthily moving into health care stocks; it won’t be long before retail investors catch on too. We won’t be coy: “At the end of October, Bristol-Myers Squibb (BMY) beat earnings per share (EPS) estimates by a full $0.20. “Beating EPS estimate by such a wide margin is no small feat,” says Alan. “Massachusetts ushered in its first day of legal recreational marijuana on Tuesday,” says our pot stock authority Ray Blanco. This comes two years after voters said “yes” to legal pot in the Bay State. “The state is starting with just two dispensaries authorized for recreational pot,” says Ray. “But it’s giving us a sneak peek at the immense demand for legal weed in jurisdictions mulling over recreational pot: Hundreds of cannabis shoppers waited in line for hours in nasty weather to make their purchases. Kennedy was a hard-core anti-pot warrior… but he’s changing his tune — ahead of the 2020 presidential election, perhaps? “Over the past year,” says Kennedy, “I’ve read, I’ve researched, I’ve had countless conversations with people on both sides [of pot legalization]. “One thing is clear to me: Our federal policy on marijuana is badly broken. Ray says: “That’s another vote in favor of federal legalization on Capitol Hill. Whoa, copper thefts are still a thing? 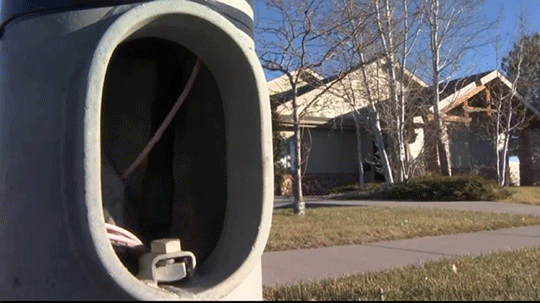 “Parts of Billings [Montana] have been plunged into darkness after thieves ripped at least five miles of copper wiring from city street lights,” reports local news outlet KPAX. Public Works Director Dave Mumford says, “They are prying open the electrical panel on the light poles, cutting the wires and then pulling the wires out of the panel. 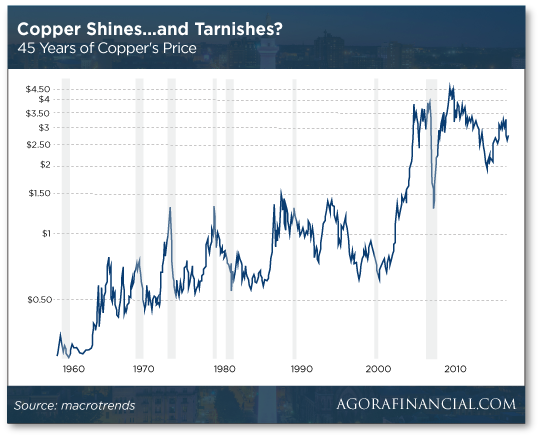 The 5’s covered copper thefts for years but they’re uncommon now with copper prices down 12% from their summertime highs… and WAY down from their 2011 peak. Maybe they decided it wasn’t worth the trouble? P.S. Even if you haven’t saved millions of dollars for retirement, Robert’s hosting a Retirement Masterclass showing how predictable cash flow — to the tune of $1,168, $2,551 and even $4,377 weekly — might be the way to financial security. One advantage of focusing on cash flow — it eliminates the fear of running out of money… a fear that’s all too real for many retirees. To get access to Robert’s unequaled financial education resources, click here now.